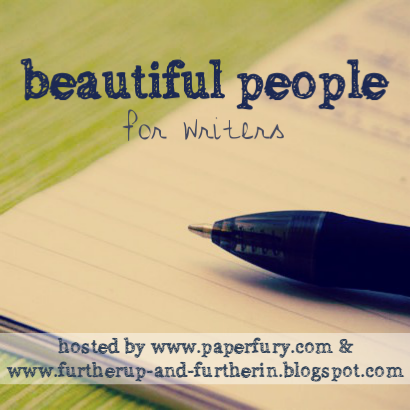 Beautiful People is a monthly blog meme hosted by Cait @ Paper Fury and Sky @ Further Up and Further In. Every month they pose 10 questions for writers to answer about – what else? – their writing. And since it’s a Valentine’s edition, guess what this month’s topic is? Yup – fictional couples from our stories! Here are my answers to Cait and Sky’s questions, focusing on my WIP’s protagonist Eva and her love interest Aurek. Eva and Aurek meet for the first time in this story. So, not very long at all. They’re both stubborn. When one refuses to compromise, it irritates the other. A little of both. They’re loyal to each other and to other characters they care about. They’re also practical and share similar values, including the well-being of their own races. Aurek’s more patient and tactful than Eva, however, while she’s more direct and emotional. They balance each other out, which I think is important. Eva wouldn’t have learned to let go of her past – and her vengeance – if it she hadn’t met Aurek. As for Aurek, he wouldn’t have been able to reclaim his people’s kingdom – or found a woman he considers to be his equal – if hadn’t met Eva. They haven’t been together long enough to think that far ahead yet. Either the tropical rainforest of Suderland or the seacoast cliffs near the harbor city of Maratel. Those are the first two places in their world that come to mind. But honestly, they cherish whatever time they can spend together, which isn’t much. Hope you enjoyed this first edition of Beautiful People! I know the information above isn’t much to go on for either character and their relationship. However, if you have any comments or questions, feel free to post them below! Yay, I’m so glad you did this! It’s such a fun meme. I love the sound of these characters and that they meet when she threatens to kill him! Makes her sound beyond awesome. Also, I feel like I’m sensing some forbidden love? That’s one of my favorite things in a book, makes things interesting. These are fun! I’ve never actually posted one though. haha I like that she threatens to kill him when they meet. Ooh sounds like forbidden love too! I find it’s helpful to write from my other characters points of view sometimes to get inside their heads, even though I don’t use it in the book. Sounds like they’re relationship isn’t going to be an easy one. I like the sounds of it though! 😀 I hope people do like their relationship once they read about it. That’s the scary thing about writing: You live inside your characters’ world for so long, you become afraid of the flaws you might be blind to. So I won’t know for sure until my beta-readers have a go at it. This was so much fun to read! I feel like I gained more insight into your awesome main character Eva 🙂 Forbidden love! ❤ Can't wait to read more! Great blog! I’m always excited when I stumble across a fellow fantasy writer. I found you from the link-up, but I’ve been on Grace&Steele’s blog as well. Their WIPs are great. There’s a part of me that adores when the potential love interests are both stubborn. The drama is exciting. But most of me is beyond frustrated. LMAO! After reading about half of the link-ups, it’s refreshing to see a slightly different tack on different questions from different bloggers. For yours it was number eight; the brother who hated Eva. Veeery interesting. I’ve actually been doing a lot of posts about the WIP in an article series called Chronicling The Craft. If you check out my post categories, or go to the Memes & Series Index page, you’ll find them that way. And I’d like to continue with the Beautiful People meme, too. What other kinds of questions have Sky and Cait(?) asked before? Oh your couple sounds interesting, with Aurek’s people having killed her parents and Eva not being allowed to date…! I like this idea. I think I’ll check out the site/meme and think about whether it’s something I’d like to do. I think it might help with aspects of the story you’re writing, maybe make you think about things you hadn’t thought of before, like aspects of a relationship, for instance. You know, I made that same observation last night when I was filling out my answers for this month’s (April’s) Beautiful People. Despite all the character building and relationship “figuring out” I’ve done for TKC, I can’t possibly think of every angle on my own. So I’m grateful for following the meme so far. Let me know if you ended up joining in!